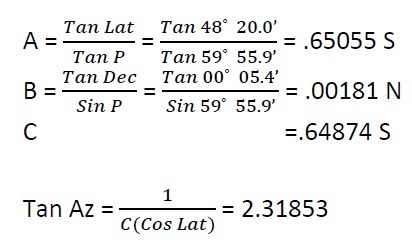 On 5th March 2008, AM at ship in DR 38˚ 11’S 151˚ 10’E, the sextant altitude of the sun’s LL was 35˚ 59.1’ when the chron (error 00m 46s SLOW) showed 10h 54m 54s. If IE was 1.3’ off the arc & HE was 30m, find the intercept & the direction of the LOP. While using below formula, one must be careful about + signs. 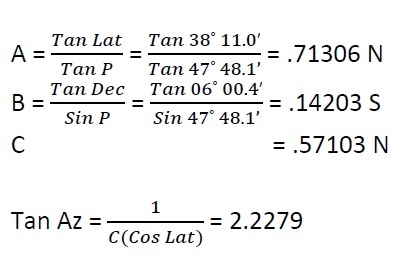 If Lat and Dec are of same name then sign is (+). If of contrary names then it has to be (-). 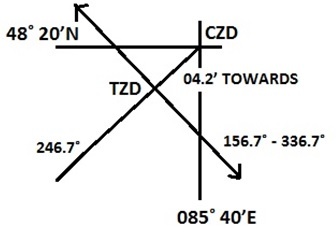 NAMING OF INTERCEPT: If the TZD is larger then intercept is named AWAY, if smaller than CZD then it is named TOWARDS. 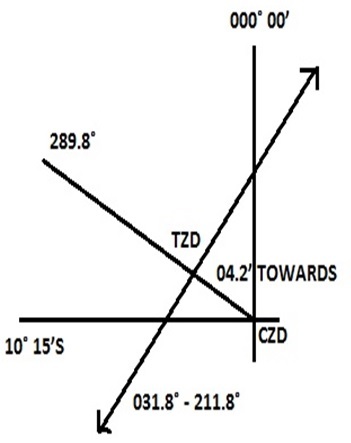 On 22nd Sept 2008, PM at ship in DR 48˚ 20’N 085˚ 40’E, the sextant altitude of the sun’s UL was 20˚ 04.9’ when the GPS clock showed 10h 09m 38s. If IE was 2.2’ on the arc & HE was 25m, find the intercept & the direction of the LOP. 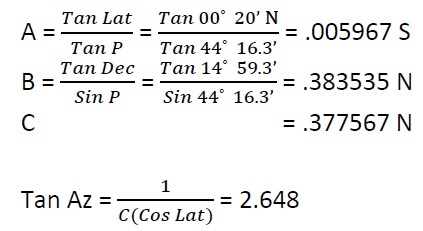 On 19th Jan 2008, at about 1530 at ship in DR 40˚ 16’S 175˚ 31’E, the sextant altitude of the sun’s LL was 43˚ 27.4’ when the chron (error 02m 12s FAST) showed 03h 50m 12s. If IE was 1.5’ on the arc & HE was 22m, find the intercept & the direction of the LOP. 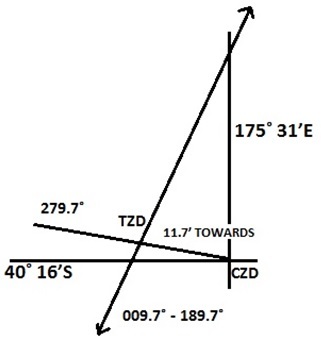 On 30th April 2008, in DR 00˚ 20’N 060˚ 12’W, the sextant altitude of the sun’s UL East of the Meridian was 44˚ 13.4’ when the GPS clock showed 13h 00m 52s. 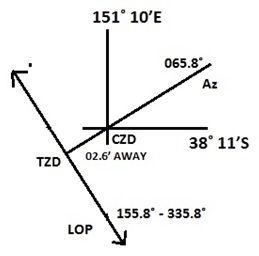 If IE was 3.1’ off the arc & HE was 20m, find the intercept & the direction of the LOP. 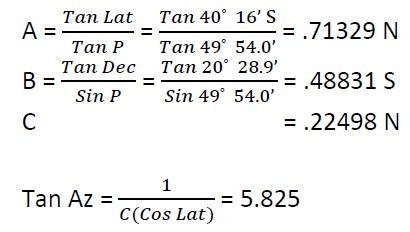 On 31st August 2008, PM at ship in DR 10˚ 15’S 000˚ 00’, the sextant altitude of the sun’s LL was 34˚ 54.0’ when the chron (error 01m 20s FAST) showed 03h 11m 30s. 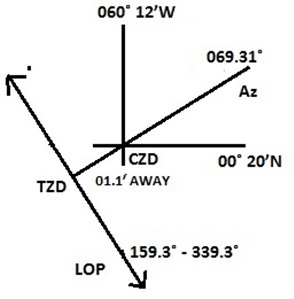 If IE was 1.5’ on the arc & HE was 17m, find the intercept & the direction of the LOP.